In late 2007 a friend of mine slipped a copy of Great Loves by Better Friends Than Lovers into my tote bag. With its cute and unassuming artwork done in watercolour, I could not have predicted that this album would ignite the flame of my great and fiery love for independent music. 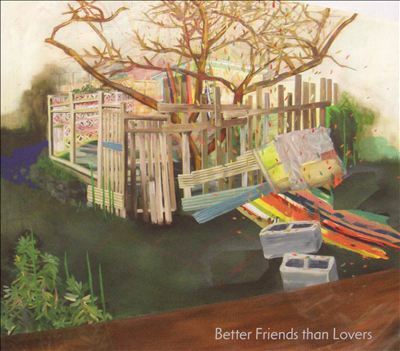 Better Friends Than Lovers was a 5-piece band once nicknamed “Strathcona’s unofficial house band” for playing shows at house parties in Vancouver’s Strathcona neighbourhood. I went to one of their shows and I was deeply inspired by how music brought a rad community together and how Better Friends Than Lovers seemed to be in the middle of it all. Great Loves was Better Friends Than Lovers’ only long-playing album, and it continues to make me pine for what could have been. First, Great Loves is a display of good songwriting and skillful playing. A tender piano solo on “Cut & Try” opens up the album beautifully. Laura Hatfield’s steady drum fills are confident and intricate – never overstated. Also, the album is extremely dynamic. “Nightbus”and “Sailor” are melancholic and ballad-like, while “Cold Sheets” is a sweaty dance track with a heavy synth lead. “Teeter” is a song about crushing on someone, while “Forget Everything” is a darker tune about giving up on a relationship. Great Loves is a busy album, but any sense of chaos is held down by strong musicianship. When there’s not an infectious piano or synth melody being played, there are flawless two-part harmonies between bassist Jeremy Pelland and guitarist Eli Leary, who sound like they were made to sing together. Their collective style of shout singing and the timbre of their voices make for the perfect blend, whether they’re singing together, in rounds, or in a call-and-response style. On the more playful tunes “Pine Falls” and “People Watching,” the duo shares most, if not all of, the singing parts. Their tight vocal blend only adds emphasis to each lyric. The songs on Great Loves are undeniably catchy, with hooks and lyrics that are undoubtedly convincing. Great Loves displays all of Better Friends Than Lovers’ best qualities: a wide variety of danceable pop rock tunes, musicianship, and impeccable vocal harmonies. We had the honour of doing a double bill with this band in Vancouver and we’re still talking about them!